The precious jewels of Gemopolis have been stolen, and the Commissioner has requested your help to recover them. You’re the Diamond Detective, and you have to collect gems, assemble clues and solve the mystery behind the heists. Diamond Detective is part puzzle game and part detective story—a neat mix for casual puzzle game fans who haven’t grown tired of the classic “match three” puzzle format. Each time you collect a chain of gems, others will replace them, so you have a constantly full game field to play with. With each progressive level, the layout of the game field changes, which can create some interesting challenges—what’s more, some tiles will be iced over until you make a chain adjacent to them. Play long enough and you’ll even find coal that eventually becomes a diamond if you create chains near enough to it. Heart-Shaped Box There’s a lot of tiles to “de-ice” and not a lot of time to do it before the caped villain gets away. There are some special gems, as well—diamonds that give you bonus points, multi-colored gems that can be used to connect two separately colored chains together, “life ring” gems that will temporarily halt the progress of the thief, and others. This is only part of Diamond Detective’s play, however—if you beat each level you’ll collect a clue. Collect five clues and then you can go to the suspect lineup to figure out who you’ve been chasing. And to do that, you have to use some deductive reasoning. There are a total of 50 levels. Sam Sparks, for example, hates fire and will do anything to avoid it—so it’s reasonable to presume that the matches you’ve found at the scene of the crime aren’t his. So you can click on those matches from your clue list and associate them with him. Sgt. Sam Gallo is a real police officer, so it’s unlikely that he’d be using a fake police badge—another clue spoken for. With five clues and six suspects, eventually you’ll figure out who the thief is, and you can nab them for good—once you solve one final gem puzzle—the Pursuit Level, as it’s called. There’s no vault meter on the Pursuit Levels, but you have to form chains that will eventually fill in all tiles to gold before your time runs out. 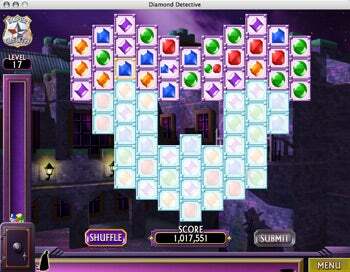 Diamond Detective is a single-player game but can be played by multiple players. (The game tracks each player’s progress separately using their names.) Options are simple, limited to sound effects and music adjustment and a full screen option. A Universal Binary, Diamond Detectives requires Mac OS X 10.2 or later and is otherwise unencumbered with any special system requirements, so it should be playable on just about any Mac running Jaguar or later. The artwork and sound effects in Diamond Detective are pretty standard GameHouse fare—not overwhelming, a bit cartoonish, well suited for the environment. The music—a snazzy toe-tapping soundtrack that sounds like it was pulled out of old detective flicks—changes as the game goes on. One thing I really like about Diamond Detective is how you can pick up your game from the same level you stop at—it’s ideal for casual gamers who only have a few minutes on the morning commute or in between meetings (or over lunch) to play some games. Matching puzzle games are starting to get a bit long in the tooth, but Diamond Detective mixes it up with some logical deduction too. Worth checking out for casual puzzle gamers who also like a good dimestore detective novel too.